Patra's Other Place: Rainbow kittens. Sorry about the lack of posts on this blog, but I've been busy making Rainbow kittens. If you read my other blog, you will know what I'm talking about, and won't need to read any further. 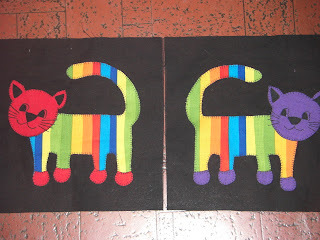 If you don't read that blog, I'm referring to patchwork blocks with multicoloured striped kittens on black fabric. Not much else going on here. Ken is still working 4 days a week and not showing any ill effects. He had a tax refund windfall of over $3000, so we are spending it on fixing things around the house that have needed fixing for years. We have replaced the hand rail along the steps to our front porch. The rail had been chewed by termites and galahs to the point where it was dangerous, but now it looks a million dollars. Yesterday we had a tradie come out and look at our garage door. It is a tiltadoor, and we have been wanting to convert it to a remote control operated door. It seems that can't be done for various technical reasons, so they are going to remove it and replace it with a roll-a-door. We are both looking forward to being able to point the remote at the garage and have the door open up automatically! The next thing will be to replace the wire screen door from the lounge to the patio; Tiger wrecked the wire to the point where both cats didn't need to wait for us to open the door. They just strolled in and out at will! Apart from those necessary jobs, we used some of the money on a luxury item. We went to an art show recently, which featured paintings and drawings of Australian wildlife, birds in particular. I think I mentioned this in an earlier post. Well, on the last day, we went back to the exhibition and purchased one of the paintings which we had both fallen in love with. Five Australian Blue Wrens on a branch of gum leaves. It wasn't cheap, but we've got it on the wall in the entrance hall and it looks absolutely stunning. Sometimes the best medicine is to buy something that you really like and it will give you a lift every time you walk by that picture. It looks beautiful. I am so glad Ken is able to keep on working. Good for him to be out and good for you to have him out and have some time by yourself to do your own things. I like the cat blocks. too cute.